Even after running in 4 municipal elections (that’s right, 4! 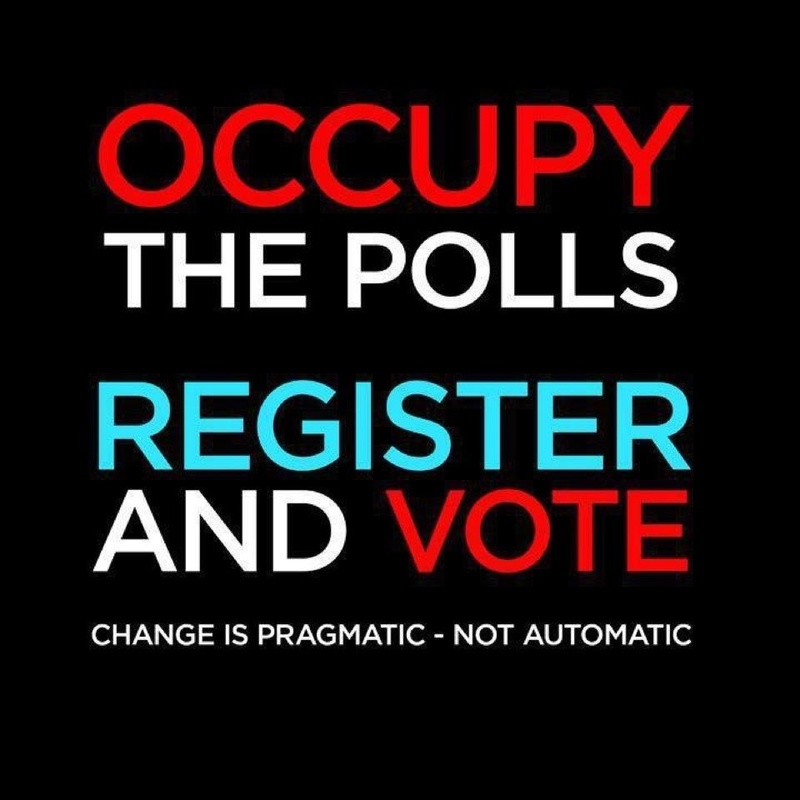 ), the process and will of the voters still has the power to surprise me, and certainly that best describes my feelings on Saturday night when the polls started to roll in shortly after 8pm. 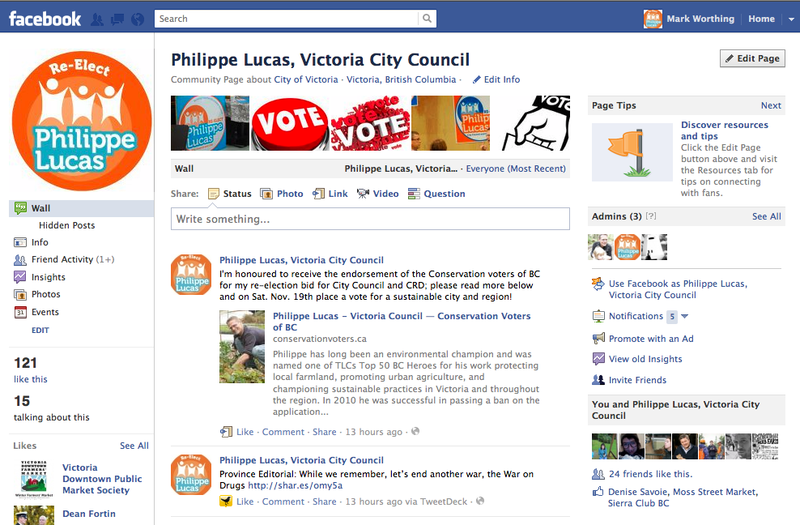 After 3 years that often involved 16 hour days working for the residents of Victoria on City Council and the CRD, many victories and disappointments, and a significant sacrifice to my family life, I went from pushing our City ever closer to the edges of progressive political and social reform for the greater good of our city, to somehow falling off the edge of voter support. I want to begin by thanking my remarkable wife Mary and daughter Sophie for their incredible patience and support over my many years of involvement in municipal issues. Additionally, I’d like to thank my Campaign Manager Mark Worthing and my campaign team (particularly the Chandler crew) who worked so hard during this bid for re-election. Lastly, thank you to those who voted for and supported me over the last three years who donated financially or in-kind to this effort. Being elected to represent the people of Victoria was the greatest honour and display of faith, hope and trust that I’ve ever received; as such I’m so sorry if I’ve disappointed you all in any way. I’d like to congratulate all of the new council, particularly newcomers Shellie Gudgeon, Lisa Helps and Ben Isitt. Steering the ship that is the City of Victoria is never an easy task, and the next few years are sure to bring stormy economic seas and a few icebergs like the Crystal Pool, sewage treatment, the Johnson St. Bridge, and LRT. Be on the look out at all times and focus on long-term planning rather than short-term fixes (that’s how we got where we are today, constantly having to chose between infrastructure closures or expensive replacement options in the midst of an ongoing economic downturn). This past council faced and overcame many challenges this term, and I’m very proud of the work that was accomplished on homelessness and affordable housing, particularly the purchase of a couple of Traveller’s Inn hotels in order to turn them into low cost housing, the legalizing of secondary and now garden suites as well, and the offer of subsidies for developers building either affordable or rental housing. It’s fair to say that we listened when the people of this city told us that homelessness was a priority, and we acted and accomplished more in 3 years that had been done during the last 10 on this serious social issue. Sadly, this work was largely reactive, and what our city so badly needs right now is a pro-active poverty-reduction and community economic development strategy to stop the flow of residents, both young and old, who end up living on our streets or in the margins of our community. Additionally, I’m pleased to have contributed to the City of Victoria’s Official Community Plan, which lays out a vision for the future of our city that we can all support and believe in, including for the very first time a section on Food Systems that even features a downtown farmers’ market, something I’ve been working towards for a number of years both on and off council. 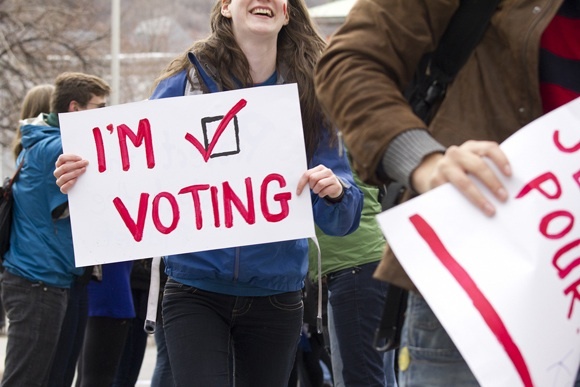 And while I was just one voice and vote on council and the CRD, I was a strong voice for social justice, equity, openness, accountability, and a loud voice for progressive social change and for policies based on science, reason and compassion, rather than fear, misinformation and prejudice. Until this last Saturday, I truly believed that I was your voice; and unfortunately, it’s not a voice that’s too rarely heard in Council Chambers or at the CRD board table. • We wouldn’t be celebrating the 3rd year of the Small Steps edible landscape garden outside of city hall, and we wouldn’t have a ban on the production, storage, distribution and land application of biosolids on the CRD; in fact, no one on council would have championed urban agriculture, food security or the re-establishment of a downtown public market; and council wouldn’t be considering a by-law to allow miniature goats in Victoria in 2012. Way back in 2002, my primary goal in running for council was to take the little bit of good I was trying to do in the community re. homelessness, harm reduction, poverty-related issues, sustainability and food security and to place it where it would have the maximum positive impact. I now pass on the same challenge and opportunity of social and economic responsibility to the three new members of council. There is much wisdom and experience in the returning council members, but often also a reluctance to re-examine or assess past strategies, direction and decisions, and to consider new ways of looking at how municipal and regional government can better serve the folks who pay for it. I came to Victoria City Council with the honest belief that government, and in particular municipal government, needn’t be seen as an irrelevant – or worse, malevolant – force in the lives of local businesses and residents, but rather as an agent that could truly work with neighbourhoods, enterprise, and community towards a great good for all. I still cling to that believe, but my experience over the last 3 years suggests that this is all too often the exception rather than the norm, so I wish this new council well in their goal of meeting the many local and regional needs of this community, both today and tomorrow. As for me and my future plans, this town still sorely needs a full-time farmers’ market, a supervised consumption site, and a strategy to reduce childhood and adult poverty if we’re ever going to achieve true social, economic and environmental sustainability. As such, I’ll keep pushing forward the progressive edges of City Hall and the CRD on these and other important policies by helping residents, City Council and the CRD work together towards a better Victoria. Hopefully, I’ll also get to spend a bit more time with my family. 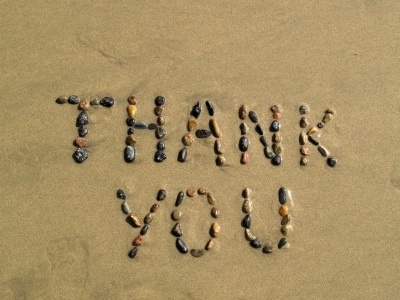 Best regards, thanks for the support, and keep up the good work! 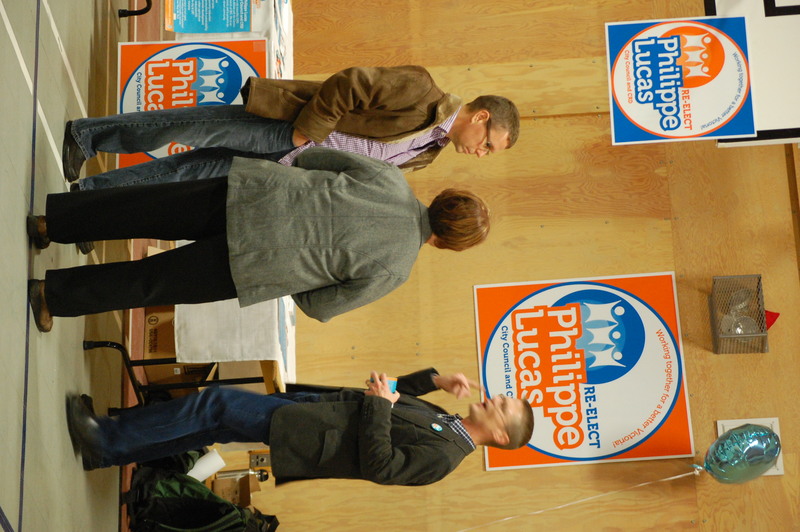 Philippe Lucas All Candidates Debate-Oct 28, James Bay from Orcacedarbough on Vimeo. Philippe has long been an environmental champion and was named one of TLCs Top 50 BC Heroes for his work protecting local farmland, promoting urban agriculture, and championing sustainable practices in Victoria and throughout the region. In 2010 he was successful in passing a ban on the application of sewage sludge on farmland in the CRD, and has passed two motions at the Union of British Columbia Municipalities to protect BC’s environment from tanker traffic, offshore drilling, and the expansion of oil pipelines. 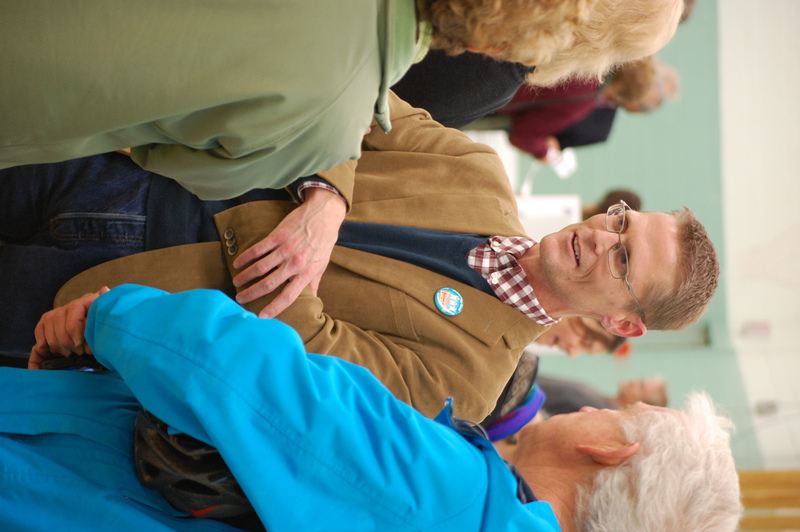 His sustainability efforts extend into the community, where as Chair of the Victoria Downtown Public Market Society he is working with key stakeholders to bring back a local food-centered public market to Victoria and has coordinated the popular Eat Here Now Harvest Festival for the last two years. 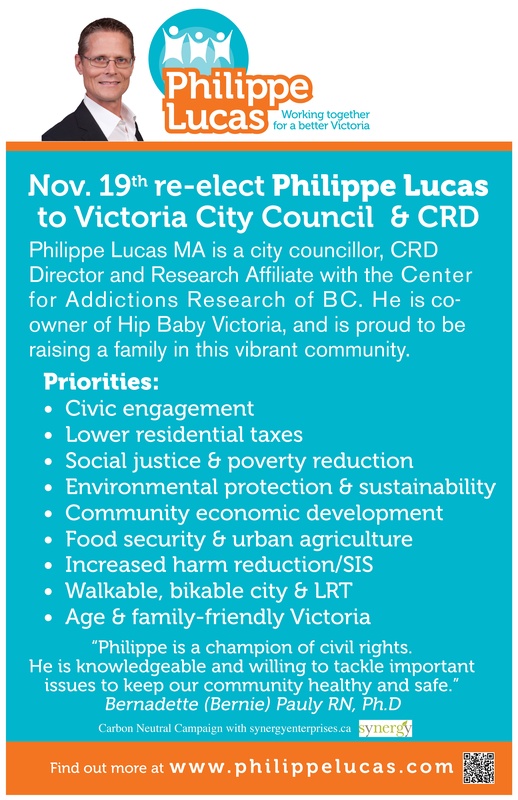 Philippe is breaking new ground by teaming with local company Synergy Enterprises to make his 2011 re-election campaign to City Council and the CRD the first carbon neutral municipal campaign in Canadian history. Can “Occupy” be a Movement Without Martyrs? A few weeks ago, Victoria City Council passed a motion that reflected the city’s support for the constitutionally protected rights to free assembly and free speech as exercised by the Peoples’ Assembly of Victoria in Centennial Square. These principles are the cornerstones of a free and democratic society, and I’m proud that council acknowledged that the growing iniquity in our world by supporting this motion and the protesters gathered in Centennial Square. A few days later, citing health and safety concerns over drug use and mental health issues associated with a homeless population that has moved into the Square, the City took steps to seek a court injunction to physically remove the encampment. Of course the Peoples’ Assembly didn’t cause the addiction, poverty, mental illness and homelessness seen in the Square, and a forced eviction will do nothing more than disburse this population back into our city parks and neighbourhoods. As such, this week I spoke with many of the city’s downtown service providers about these issues, and many have agreed to increase service delivery to those needing it most in Centennial Square. “Can the Peoples’ Assembly of Victoria be a movement without martyrs? Is the only potential endgame for this protest to hold this small patch of land until it’s occupants are forcibly removed, and potentially injured or arrested? Will the shouts heard from this square over the next few weeks simply echo centuries of ongoing oppression; or can they be songs of hope, renewal and community empowerment? As a resident of Victoria, a social justice activist, and a local City Councillor, I believe that the ideas and ideals of this protest are far stronger than the thin nylon tents that protect you from the elements, and run far deeper than puddles that occasionally dampen both spirit and possessions in this public square. I have and will continue to defend your constitutional right to gather here in peaceful protest, but I urge you to consider an alternative. I urge you to consider the great strength and honor that comes from deciding when and how you leave this place, and the power of surprise and delight that would accompany a peaceful, voluntary demobilization. I urge you to consider the public support that would be garnered from a joint decision to simply pick up, join hands, lift your heads high to the sky, and sing a song of freedom while moving forward towards the next stage of “Occupy Victoria”, whether that be flash mobs, flash camps, general strikes, etc. I respectfully propose to the assembly that while there may be a perception of strength in simply holding space, there is much more power – and the potential to deliver a much stronger message to those who hope for a peaceful, non-violent resolution as well as the voices who have been urging a crack down on this encampment – in deciding when and how you claim, as well as when and how you leave, this or any other place of protest. Whether or not the city’s injunction request is granted by the courts, it is my hope that any actions taken in Centennial Square and in parks and public squares all over the world over the next few days or weeks will be informed by a spirit of compassion and cooperation, and that all involved – from police to protesters – will find the resolve to allow a peaceful end to the initial phase of this international protest. I’m currently a City Councillor and CRD Director. My responsibilities include: Chair of the City of Victoria Environment and Infrastructure Committee, Community Development Committee, Council Liaison to City of Victoria Youth Council, Council Liaison to Quadra/Hillside and North Park, Trustee on the Greater Victoria Cemetery Board, CRD Board, Hospital Board, Vice-President of the CRD Housing Corporation; CRD Environmental Sustainability Committee; Core Area Liquid Waste Committee & Solid Waste Advisory Committee. 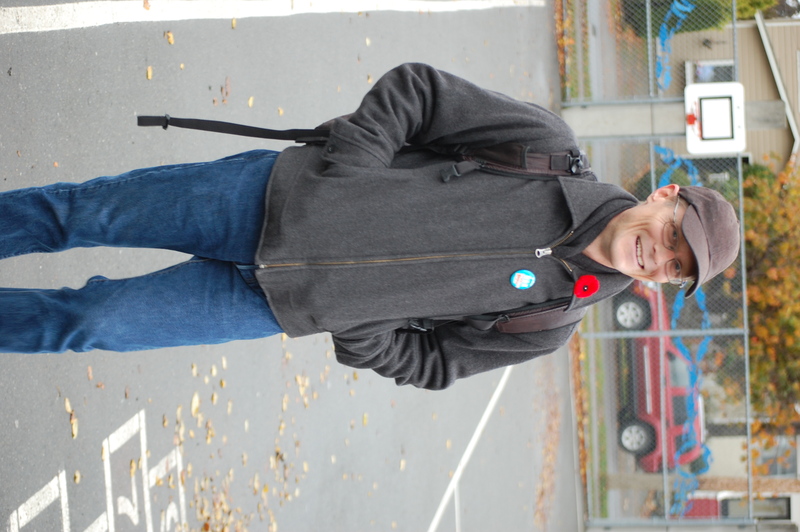 My previous experience includes being a member of the Student Teacher Advisory Committee and the Secondary Program Council while studying to be a secondary teacher at the UVic. I have a long history of community involvement, largely focused on homelessness, harm reduction and food security. I’m currently on the Board of the Vancouver Island School of Art and the Vancouver Island Compassion Society, on the Advisory Board of the Center for Addictions Research of BC, the, and the Chair of the Victoria Downtown Public Market Society, a non-profit working to bring a public market back to our downtown core. Additionally, I am the coordinator of the Eat Here Now Harvest Festival, which drew over 10,000 residents in support of local food and farmers to Centennial Square last September. What are the top three issues? 1. Lower Taxes & Keeping Resources Public: I was the only councillor to vote to lower the residential tax rate in 2011. At the CRD, I was the sole Director to vote to keep our sewage treatment project 100% public. 2. Homelessness & Harm Reduction: I’ve championed a significant in affordable housing and passed motions in support of increased harm reduction and supervised consumption sites. 3. Environmental Sustainability: I spearheaded a ban on the land application of sewage sludge on farmland in the CRD, and passed a motion calling for a moratorium on the installation of Smart Meters in Victoria. I work hard to make pragmatic, well-informed decisions, and to represent a progressive voice on city council and the CRD. Over the next 3 years I’m going to promote strategies to boost our local economy; improve food security; increase civic engagement; reduce poverty, homelessness and addiction in our region; and create a more age and family-friendly Victoria. At the CRD, I’ll ensure good value for money and public ownership of the regional sewage treatment strategy, and continue to protect unique natural resources like the Juan de Fuca Trail and our regions farmland. What are the best things about your community? I love the diversity of age, cultures and ideas that distinguishes Victoria. The remarkable creativity, commitment and cooperation that this community displays when faced with both challenges and opportunities is what makes living and working in Victoria so inspiring and rewarding. A great example is the many groups and individuals who give so much of themselves to address poverty-related and environmental issues in our region, ranging from homelessness, to smart meters, to food security. In Victoria, change and progress truly comes from the community, and the city needs to more to encourage, promote, and empower community development and social enterprise. What are the most vexing things about your community? The most vexing thing is the long-time deferment of spending on infrastructure that has left so many of our facilities and core systems like bridges, roads, sewage and community centers vulnerable. Unfortunately, short-term thinking and poor spending decisions by past councils means that our city is now left with the responsibility to address a backlog of 50 years of basic maintenance and upgrades, and that continues to compete with other municipal goals and spending priorities. One solution is a shift to pragmatic, long-term planning and responsible management of our many municipal resources. Chickens should not be the only farm animals allowed in the urban environment, says Coun. 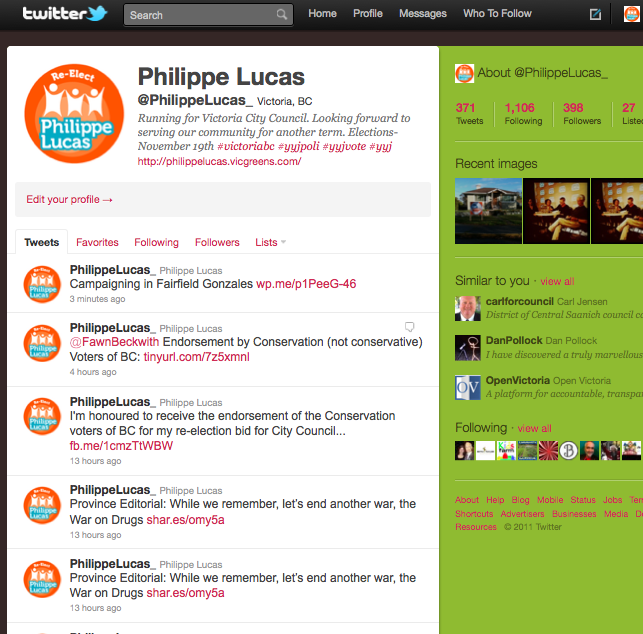 Philippe Lucas, who wants miniature goats to be allowed in the mix. “The whole goal of this would be to allow people to milk goats for cheese production within the city of Victoria for their own consumption,” Lucas said Wednesday. Lucas last week won council support for an initiative he earlier shepherded through the environment and infrastructure committee to have city staff investigate the feasibility of allowing residents to keep miniature goats. “I was approached by a number of people interested in food security and people who are avid urban farmers or gardeners, and asked to look into the possibility of keeping urban goats,” Lucas said. Lucas said dwarf goats produce an average of one kilogram of milk a day and some will produce up to 3.6 kg a day. Lucas said in other jurisdictions, such as Seattle, miniature goats are licensed in the same manner as dogs. “So it’s a very simple bureaucratic process to be able to manage this. There’s limits on the number of goats you can keep on a property based on the property size,” he said. Miniature goats, which are about the size of a medium-size dog, are also known as pygmy or dwarf goats. The animals weigh between 22.5 kg and 45 kg and grow to about 0.6 metres. The goats are certainly quieter than many dogs. If approved, Victoria would be following the lead of its neighbours to the south. Seattle passed a bylaw in 2007 that classified minigoats as small animals rather than farm animals. That city now licenses them like dogs, cats, exotic animals and potbellied pigs. The University of Washington has been known to hire herds to clear slopes of blackberry brambles. People who want to keep goats will have to get a licence for them, as for a dog or cat, and have them dehorned. Male goats must be neutered – the unaltered male gives off a musky scent that some find offensive, goat experts say. Seattle’s urban goats are not allowed in off-leash areas or anywhere outside the owner’s yard, with the exception that they can be lent to other owners to graze in their yards. Portland and Everett have also passed legislation legalizing the goats. Victoria, Oak Bay, Esquimalt, Saanich and Central Saanich all allow hens on smaller, residential-sized lots.